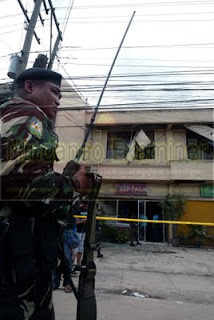 CITY (Mindanao Examiner / Oct. 10, 2011) – Philippine authorities have tightened security in the southern port city of Zamboanga following two bomb attacks that injured 11 people, officials said Monday. No group claimed responsibility for the weekend attacks that coincided with a Christian festival honoring the Virgin Mary. The bomb explosions ripped through a budget hotel and a cockpit arena. “We are in red alert right now and we have doubled our security to help local police secure the city,” Army Colonel Buenaventura Pascual, commander of an anti-terror task force, told the Mindanao Examiner. He said more soldiers were deployed to patrol the outskirts of Zamboanga to prevent lawless elements from sneaking into the city during the culmination of the weeklong religious festival on Wednesday. It was unknown whether the Abu Sayyaf was behind the bombings, but the militant group tied by authorities to al-Qaeda and Jemaah Islamiya had previously targeted Zamboanga.